Having recently viewed three feature-length films about Coco Chanel, all of which emerged around 2009-—Coco before Chanel, Coco Chanel & Igor Stravinsky, and Coco Chanel-—I decided that it might be nice to read a book about her, given that the sum total of my knowledge of the topic was exhausted by the information relayed in those films. Little did I know that there are hundreds of books about Gabrielle “Coco” Chanel. Most of them are thick tomes with lengthy bibliographies many of the entries of which are earlier biographies of Chanel, and all of the hefty biographies which I took a look at (but did not read) repeatedly cited texts from previous biographies. The history of Coco Chanel has become a veritable industry with scholars writing new biographies presumably to supersede previous biographies, when in fact the primary source of most of the information revealed in any of the books is also previous books. That is the nature of historical research, of course, which for that very reason has never appealed to me. I am happy that other people are willing to mine through mountains of earlier historians' books to try to figure out what is true and what is false about what has already been said, but I am far too much of a skeptic to be able dedicate my life to that sort of task. Attempting to discern the false from the true in the interpretations of previous historians about important persons and events strikes me as otiose at best. What are the criteria applied? Are not historians often seduced by interpretations which have been artfully designed? How can a person write a book today about someone who died more than forty years ago? Well, by studying all of the already existent books and attempting to find a “new” angle. Or by locating previously unknown sources of information, in newly discovered letters or documents, or in archives not already mined. To be honest, I have never really understood how people get grants for historical research in archives. I realize that some of them are looking to answer a specific question, but the notion that there is something in an archive to be found, precisely the information needed to answer one's research question, seems tendentious, at best. It also supposes that previous treatments of the topic were inadequate, and the only grounds I've been able to come up with for believing such a thing, in a general way, as the basis of a profession, seem quite pragmatic to me. Burgeoning historians wish to secure positions, and once in academia, they wish to remain gainfully employed. Since coming up with a “new” angle is what historians are required to do in order to survive professionally, it naturally behooves them to diminish the value of earlier works on their subject so as to elevate their own. It's a strange sort of paradox really, because students of history must simultaneously pay the proper deference to their mentors (also historians), while coming up with something new to say, which seems to imply that at least some of their mentors were wrong. The most interesting question in all of this to me is: why would one believe a priori that there was a new or better angle to come up with? Are new readings supposed to be better simply because they are new? In the case of new translations of literary works, the thinking seems to be that as language evolves and cultures change, translations need to be updated. That is why translations of works as old as Plato's Republic continue to appear with each new generation of scholars. There are the so-called canonical translations, but young scholars of both ancient Greek and philosophy sometimes put forth newer translations, presumably regarded by them as necessary, which would seem to imply that the currently available translations are in some way inadequate. In the case of history, the situation seems far more puzzling to me. Anyone who wishes to write a biography of Plato has commenced from a biography-derived understanding of Plato. To modern people, Plato may as well be a fictional character, since all that we have are dead people's accounts of his life. So what could a new biography of Plato possibly say which has not already been said without simply inventing something new? Needless to say, the above skepticism clearly demonstrates that I would never have made it through a graduate program in history, had I been foolish enough to matriculate in one. How to adjudicate such a delicate and untenable duality? How to both criticize as wrong while paying deference to earlier historians at the very same time? No, thank you all the same. To return to the case of Coco Chanel, I confess to having been a bit overwhelmed by all of the scholarship on this topic, and it seemed to me that there are basically two kinds of books on offer. First, there are the loyalists, the true believers in Coco Chanel as a great woman, and then there are the anti-loyalists, concerned to reveal her arrant depravity and to expose her for the scoundrel she really was. It makes sense that biographers should be polarized in this way, because anyone who goes to the effort to write an entire book about a topic tends to care quite a lot about it. Yes, passion seems to drive the so-called dispassionate quest for truth in history as elsewhere. Having myself no interest in becoming a Chanel scholar, I finally decided to opt for the most recently published book which was also as short as possible, since I figured that I'd be sure to learn at least enough from such a book to determine whether I find Coco Chanel a topic sufficiently interesting to warrant reading a lengthier book about her. The book I ended up checking out, Coco Chanel by Dennis Abrams, was published in 2011 and spans a grand total of 124 pages, including an index and chronology. “Perfect” I thought to myself as I requested the book from the library online. When the book arrived, I was quite surprised to find that it looked an awful lot like a school textbook. The print was large and there were many sidebars and other clues that this little volume was intended for educational purposes. For one thing, the blurb for the author, Dennis Abrams, indicates that he has also written biographies of Hillary Rodham Clinton, H.G. Wells, Rachael Ray, Xerxes, Albert Pujols, Georgia O'Keefe, and Nicolas Sarkozy! Apparently Mr. Abrams, “a voracious reader since the age of three,” chews through scholarly biographies of famous people and then spits out short readable synopses of their lives. So this book, from the Famous Fashion Designers series published by Chelsea House, is in effect a Cliff's notes version of all of the big fat biographies which I was not sufficiently motivated to read based only on what I had learned about Chanel in three recent films. I initially hypothesized that this might be a book for vocational tech students who are learning how to sew or perhaps for introductory students at a college of fashion design, primarily because some of Abrams' jibes at Coco seemed a bit too pointed for younger students. He makes a rather big deal out of the fact that she often lied about her life, particularly her lowly origins, and at one point he insists that she was not a designer because she never designed anything in the sense of drawing or sketching a design on paper. Eventually, after having read the book, I searched for Chelsea House online and discovered that this book is intended for grades 6-12! As a true testimony to my severe deficit in the Coco Chanel scholarship department, I must confess that I managed to learn quite a lot from this little book. Well, I think that I learned from it—-if what Abrams has written is true. What he suggests is that the films which I viewed were loosely based on history, with all sorts of modifications made to increase the coherence of the films as works in and of themselves. Facts about Chanel's beginnings in the world of fashion, how she supported herself, and why she never married seem to have been distorted in the films in order to make her seem more independent and admirable than she may have been. According to Abrams, Chanel did not marry Hugh Richard Arthur Grosvenor, but the reason seems to be that she was by then too old to bear him an heir. This is a very different version of the story than the one at least suggested in the films, which impart the distinct impression that Chanel was fiercely independent and refused to marry any man. So much for the feminist myth. According to this account, Coco Chanel was definitely a liberated woman, but she was not a promoter of other women's liberation. The major contribution she appears to have made was to liberate women from their corsets, which was of course a good thing, but it's a far cry from feminism. I learned a lot from this little book, as elementary as it is. The writing is not the best, but the text is readable. It certainly managed to pique my interest in this topic to the point where I now feel sufficiently motivated to take a stab at one of the larger tomes. I am especially interested in the story of the Wertheimer brothers who completely controlled the Chanel perfumery business. Coco Chanel apparently left everything to them when it came to perfume, initially because she wanted to focus on fashion. Later she regretted having signed off the rights to Chanel no 5, which was a resplendent success under the Wertheimers' management, but Chanel received only a small portion of the profits as a result of her contract with them. To find out more about that story, I'll need to read a bigger book. And I shall. 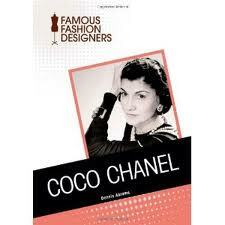 I do recommend this slim volume as a primer to people who are completely ignorant about the life of Coco Chanel. It would be a perfect lazy afternoon at the beach read as it offers enough of this woman's extraordinary life to keep even those who generally steer clear of biographies intrigued. Hi Sherapop, what does Dennis Abrams say about "Operation Modellhut"? I read Charles-Roux' Chanel biography in my twenties. To be frank: I hardly remember it. And it did not leave a very big impression on me -- Chanel, the person. So I don't know whether I should recommend it. The German translation (that I actually have on my desk right in front of me now) appeared in two respectable publishing companies. Well, I guess the interesting aspect is distinguishing fact from fiction. Coco started her own myth making. (Like Marilyn Monroe) And sometimes a biographer is fascinated by that ... and most of them end in the cobwebs of illusion :))) Personally, I find liars boring. I have better things to do than to research whether I've been told the truth or not. However, I understand her contributions to the world of fashion and design. Yes, I've always imagined her as a very hard, exploiting (and exploited), vain, and --alas -- artificial, opportonistic person. Gabrielle really became Coco, her own persona, image, figure. My grandmother used to say that as people got old they got the face they deserved. I find it hard to believe that she liked herself. But Coco had a hard life. History is always subjected to ideology. Take e.g. an Italian history textbook and an Austrian one. Read sections about the first World War or Südtirol. You'll be amazed. (I have been told that the same holds true for German/French versions on Elsass-Lothringen.) Or look at historical maps and find out how they differ from country to country. Who's right? It's interpretation, perspective and a good deal of ideology. For me it's also exploring the limits of knowledge. Don't look down on school textbooks :))) I recently came across one that I bought because I like the author a lot. Liessmann: Vom Denken. Einführung in die Philosophie. Wow ... some of the things he writes (and questions that he raises) are pretty courageous for a book to be used in Austrian schools (if they happen to have philosophy as a subject). Well, I guess every translation is also an interpretation. Remeber Faust trying to translate "logos" into German? Kraft, Wort, Tat, Vernunft, Verstand? Bis zum nächsten Mal, die Sonnenblume. ps. I did not forget about the archtecture theory thing. I'm still working on that one. Abrams does dedicate three whole pages (a lot, given that there are a grand total of 111 text pages...) to "Operation Modellhut". The section is somewhat laughably titled "Could She End the War?" and Abrams definitely offers a sympathetic reading of the madcapped scheme, citing Chanel as telling her Nazi lover Spatz, "You Germans don't know how to handle the English! I do!" So I guess that we can interpret this as a minor manifestation of megalomania on her part? She appears to have regarded the war from her business perspective, asking, "Isn't it in everybody's interest to shorten the war, to save tens of thousands, perhaps hundreds of thousands of lives?" Too little, too late, Coco. The fact that she found the war an “opportunity” to regain control of her perfumery business (given that her partners were Jewish...) and that she somehow thought that the Germans and the British could shake hands amicably and agree to disagree seems laughable, but we can hope that she was detached from the reality of the camps? On ne sait jamais.... I think that I may really have to read one of these biographies which digs into the Wertheimer story. You are right that my skepticism about biographies applies more generally to history. The victors write history, no doubt: whoever gets the last word! My favorite phrase about translation: Rien ne se traduit. Vielen Dank, meine liebe Sonnenblume! Another thought-provoking post, Sherapop. Although I've attended school for more years than the average person, I feel the same way about advanced studies in history (and several other subjects) - if what you need to do to be considered "learned" is rephrase what others have written, the heck with it! I've not read any of the books about C. Chanel, only a few articles. And it doesn't seem like there is very much admirable about her that isn't also admirable about, say, Leona Helmsley. It's somewhat interesting how someone employs her monomania to achieve notable things, but... not that much, to me. There's a shortage of kindness and justice in the world, so my preference would be to read about people who dedicated their lives to kindness or justice. Hello pitbull friend! Very nice to see you around these parts! Chanel is no doubt a complex person, and we can probably all agree that her success is remarkable, given her origins. At what price? is the question, of course. I agree with you that there is a limit to the interest of the stories of people fighting tooth and claw in a jungle red with blood. The stories often do seem similar in many ways since they are but variations on a theme... The important thing, I think, is not to get carried away and conclude that success equates to greatness. Perseverance and ability to survive are one thing: a manifestation of a type of strength and power; moral praiseworthiness is something altogether different. Ah Chanel, Nazi sympathizer and New Jersey entrepreneur. Nice post! Thanks, Bryan! She's a work--no doubt about it! Hi, I re-read your entries on this page and I get the impression that things are getting mixed up a little bit. a) The Chanel biography I read was not written by a historian. Ms. Charles-Roux worked for fashion magazines and wrote a novel. Which Chanel biographies were written by historians? b) History as a subject is a serious and important thing. If we do not understand our past, what future do we have? I refuse to live by the motto "Let bygones be bygones" and "hush hush it all happened such a long time ago", or "let's not disturb tranquillity". As you said further above, historians research documents. Usually these documents are kept locked away in state archives and it's not easy to have access to them. Often states deny researchers files. Sometimes the files are opened many many years later. So, yes it is important to go look at these documents and maybe re-write history in some way and maybe reveal that what we believed to be the truth was, in fact, nothing but a myth. Injustice only begets injustice. Researching documents is only one method. The other, of course, is knowing what has already been written before. Even historians must place their findings in some context. c)In some countries (definitely where I live) people attend university because they want the academic title. They don't really care about the subject they're studying. University is something tedious, an obstacle on their way to fame, money, social position, job, whatever. Professors are losers that talk in a bizarre way and spend their time seeing problems where common sense doesn't perceive any. Here the method problem comes into play: Read and then write a summary (or have it written), then get your degree. d)I think good translations are inevitable. Translating is a tough thing and I seriously believe that good translators should be better known (and better paid). Their efforts and achievements should be respected. Nobody will ever be able to speak all the languages in the world. We would surely miss a great deal of information, literature etc if we only read in languages that we actually speak. Translators are mediators. Ok, I said what I had to say, now I can go to sleep, Girasole. I agree with you, Girasole, that translators "get no respect," when in fact they have one of the most difficult jobs ever. It's completely thankless because no matter how painstakingly they attempt to translate a work, there are always tons of people who jump all over them crying foul. Maybe translators are masochists. I don't know. It seems a lot easier to write than it does to translate, IMNSHO. Plus then no one can accuse you of any crime against literature. Maybe they won't like what you write, but at least they won't hold you morally culpable, as they seem to when it comes to translations. Sorry if I gave the impression that history is not important. Of course it's important. I for one am looking forward anxiously to the rewritten version of the story of the 2003 invasion of Iraq as the violation of international law which it was, which implies that every person who died in the conflict was a victim of a war crime. Well, that was somewhat of an off-topic rant, but I think that I have illustrated that I do believe in facts. ;-). Sorry for my late reply--for some reason I did not receive any notifications about recent salon comments, including yours. Have you ever tried translating a literary text? I had to at university. And I remember the 2 session exam: On the first day we had to translate Henry James into German (without dictionary, of course, and the sections were taken out of context, to make it more exciting for the students, I guess), on the second Musil into English. (No, I did not study to become a translator.) I cannot say that that was fun. But I suggest this exercise to all the people who show disregard for translators. At best their translation will read awkward. Or incomprehensible (esp. when they stick too closely to the original's syntax) But it will never read like James or Musil. Translators give you the impression to really read Musil or James in another language. That's what I call talent. Thanks for clearifying your p.o.v. when it comes to history and facts. I just wanted to say that not everyone attending university does so because they are planning on a research career. Furthermore biographers do not necessarily have to be historians. I made the observation that when a famous person has some sort of anniversary biographies come out like mushrooms after the rain. Writers want their slice of the cake (i.e. write a book that sells). I just wanted to point out that it's unfair to blame "history" (the abstract subject) for it. Have a good weekend, hope to hear from you soon, Girasole. Guten Morgen, meine liebe Girasole! Yes, as a matter of fact, I have done a bit of work as a translator—both into and out of French. (I have publications of both kinds.) It is incredibly challenging and difficult to rein oneself in, so to speak. As you say, the temptation is to "improve" the text which one is translating, which just means bringing it into conformity with one's own values. There's a question of vanity involved in this, too. If one's name is going to be attached to a text, and one is sure that the author would have been better off doing a certain thing or expressing an idea in what one takes to be a more eloquent way, then one may slide into the phenomenon you describe, where the translator transforms the text so that in the end it sounds more like him/her than the author! So, yes, I was speaking with the voice of experience in saying that translation is incredibly difficult. I cannot imagine doing it as a full-time profession. In the first case, I just found myself in circumstances where "the opportunity" arose: a professor asked me to check over a French translation of his paper which was about to be published. The translation was so horrible—full of Franglais—that I could not in good conscience permit it to be published. But by the time I had fixed it, the translation was completely new, and it was published as my own. In a couple of other cases, I was working in publications production, and my boss was too cheap to allocate funds for translators (or anything, for that matter...), so I did the jobs myself. I did also work briefly as a professional translator, as I was hired to produce a translation of a portion of a reference-type book, but I put so much time into the project that I realized that I was holding myself to an unrealistic standard, given the fee I was being paid for the job. I have not sought out or accepted other translation gigs since. A propos of your point that not all (or even most) biographers are historians: Stimmt! It's always a pleasure to read you here, meine liebe schöne sokratische Sonnenblume!